There is a good chance that everyone who uses an iPhone knows how to take a screenshot – you press the home and the power button at the same time. Sure, you need to watch your timing so you don’t accidentally turn it off or exit the app you are trying to take a screenshot of, but it’s easy enough to master. But now you have a shiny new iPhone X, and you want to capture something. But wait, there is no home button. So, how do you take an iPhone X screenshot? Let us show you how. The iPhone X did away with the home button and reclaimed all that valuable space for new screen area. The result is that you have a bigger screen than the Plus series of iPhones while being about the same size of a regular iPhone. While that’s nice (very nice), it does force the user to make some changes as to how they do the same functions that they did with the home button. For most uses (app switche, etc. ), simple gestures replace the physical button. But for an iPhone X screenshot? Simple – press the volume up and power button at the same time. When you simultaneously press the volume up and power button on the iPhone X, you are rewarded with a nice new screenshot, complete with editing tools courtesy of iOS 11. But just as you had to do with the previous home button and power button combination, you have to watch your timing. What could happen if you aren’t careful? Well, in this case, you could still turn off (or technically lock) your phone if you miss your timing window. And whatever you do, don’t keep holding the volume up and power (lock) button combination for an extended period of time. Otherwise, you could trigger the Emergency SOS feature on the phone. When this happens the iPhone X will lock and load the emergency SOS screen. If you keep holding the buttons beyond that the iPhone X will reach out to authorities for help, something that could be expensive AND embarrassing. You probably don’t want to do that, so just remember to do a simple volume up and power button press to take an iPhone X screenshot and you won’t have any problems. This might be a great time to explore the great new functionality that iOS 11 has added to the screenshot process. It used to be that a screenshot was immediately saved to the image roll with only a quick flash of the screen and a shutter sound. Now you still get a shutter sound, but the new image hovers on the bottom left of the screen. Simply tap on it and it brings up an annotation panel for quick editing, including such functions as cropping, markup, and highlighting. I’ve used it a lot and find it to be very convenient, especially compared to the previous version of screen capturing on iOS. While we are on the topic of screenshots, did you know that there is a very simple way to do it on a Mac? You can read more about that in our article here. 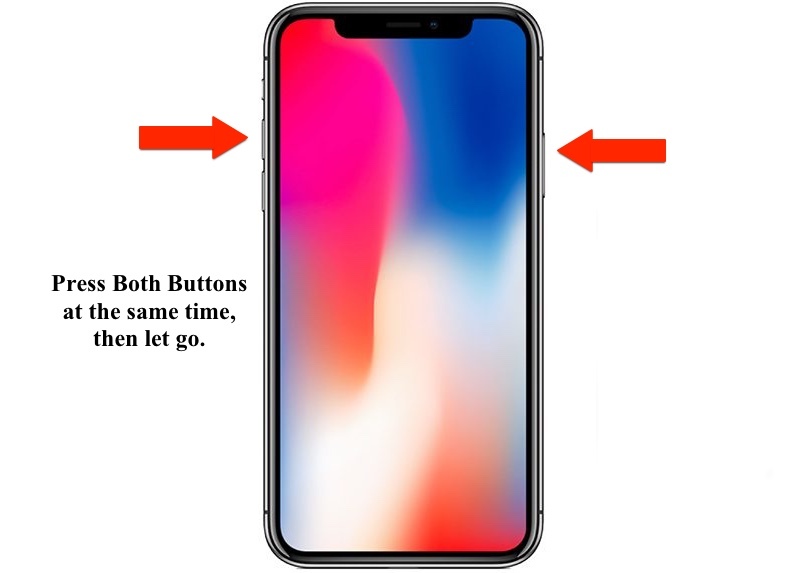 That is all there is taking an iPhone X screenshot – just use the volume up and power (lock) buttons at the same time, and don’t hold the button down for a really long period of time. Unless of course you, are trying to summon help. I think you’ll find the iPhone X screenshot to be really convenient, and with the added functionality of iOS 11, your screenshots will be taken to the next level of screenshot nirvana. Well, I hope it will be handy for you, anyway.